It’s 2am on November 9, 2016. 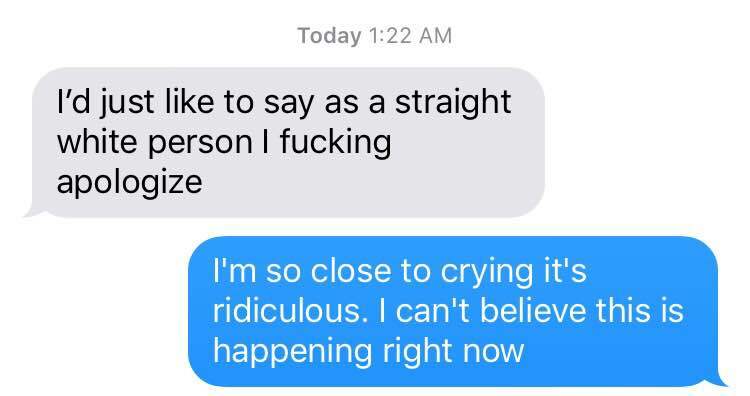 I sit bedside with my roommate, who also identifies on the LGBTQ+ spectrum. We sit and watch the final numbers light up the TV screen. Donald Trump is our next President. Mike Pence is our Vice President. This is our reality, and our future is now uncertain. We embrace one another as we sob uncontrollably, running through every possible danger we may now face in this new world. In an America that believes we do not belong. 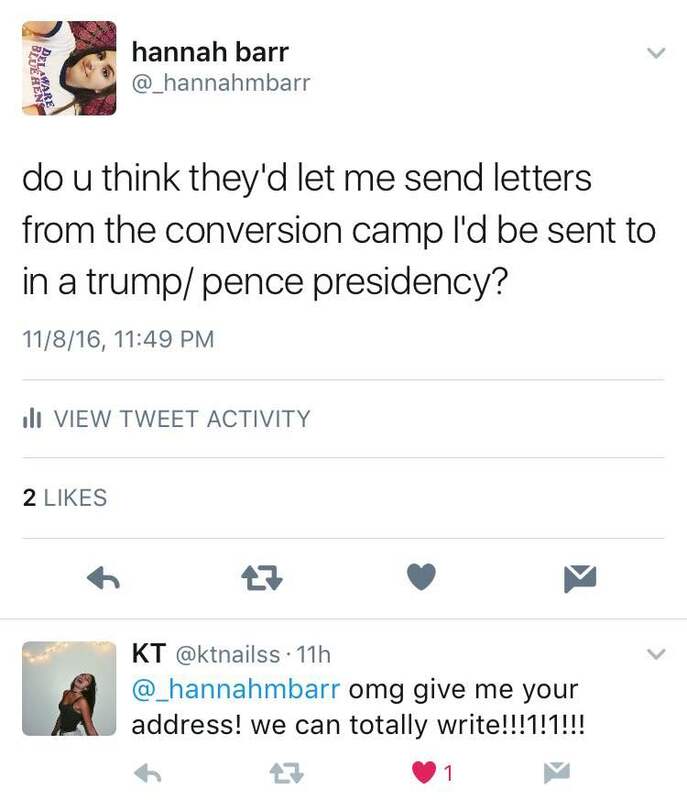 That believes conversion camps can save us from our sins. That believes something we cannot control is a sin to begin with. We start to think strategically about our lives. Will we have to remain closeted during job interviews? Will those around us feel less obligated to be politically correct in their language towards us? Can we still get married? Can we have children? 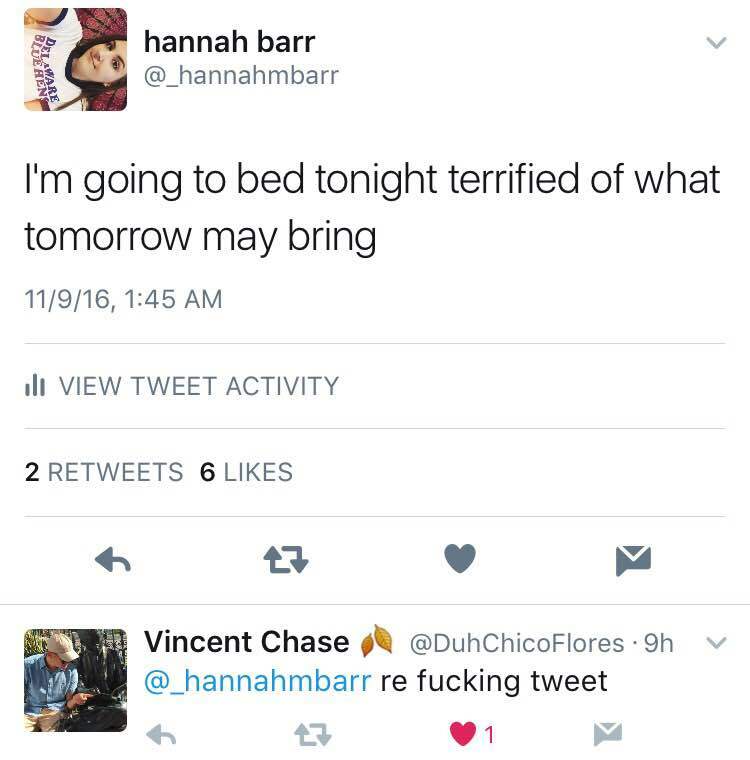 It’s 4am on November 9, 2016. My phone begins to light up with notifications of text messages from my friends from home, whose parents are immigrants. “I’m sobbing right now,” “I’m going to get deported,” “I’m terrified.” We try to reassure one another that things will be OK. But we all are aware that we are uncertain if these promises can be kept. Many people reading this article know me. You have had class with me, you have played sports with (or against me). You have seen me around campus or follow me on social media. You are my friend, you are my family. And this is the America you have left me in. I am genuinely afraid for my future. You can sit there and claim that you are not a bigot, and that you are not a homophobe. I am sorry, but I do not care to hear what you have to say. 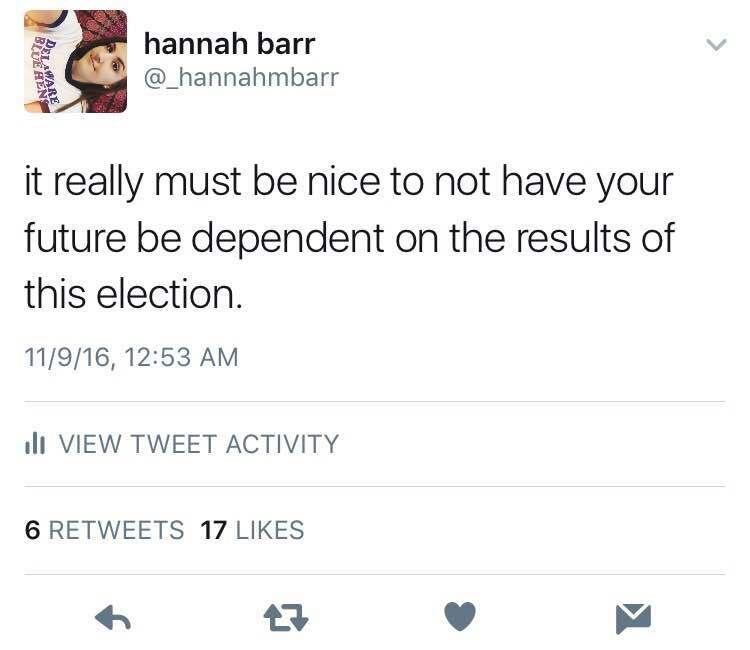 You were too selfish to look past your own privilege, and realize what this election meant. This is not about Republican vs Democrat; this election was about hate vs acceptance. But you already knew that. If you think that I’m being dramatic, or cannot understand why this election matters so much, than you are the problem. Now it is 11am on November 9, 2016. And I am planning to live in an America where I no longer feel I belong.